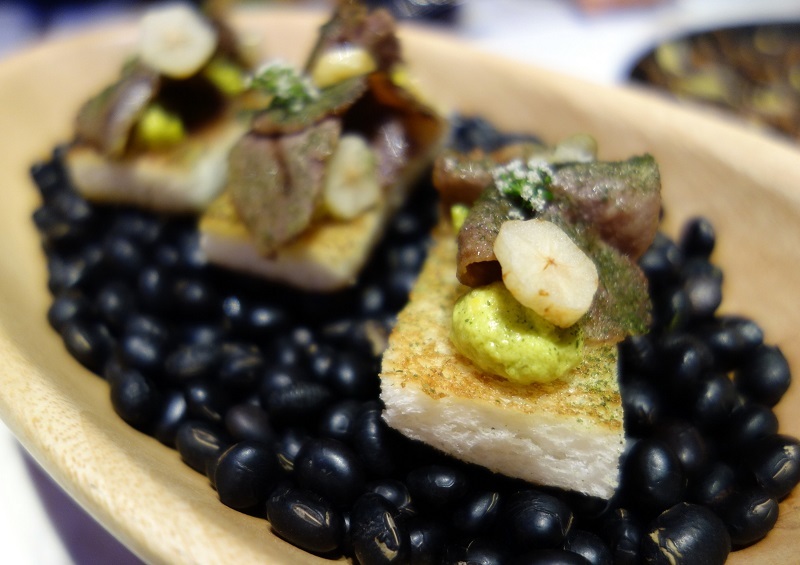 Exploring the country’s multi-hued, multi-textured food from a fresh perspective. The unobtrusive entrance to one of Kuala Lumpur’s newest eateries is a nondescript doorway festooned with plastic fronds in a wall draped with plastic plants. Enter a narrow red chamber through thick curtains and before you lies the cavern-like space of Beta. Opened in January, it is the brainchild of Raymond Tham and his colleagues, who are also behind [email protected] in the neighbouring building. There’s a daub of fantasy to Beta with its classic black-and-white checkered floor. The central column of its bar, reminiscent of a Chinese medicine dispensing counter, dispenses more than Chinese herbs. Rattan easy chairs are arranged around the space, as are big potted plants. 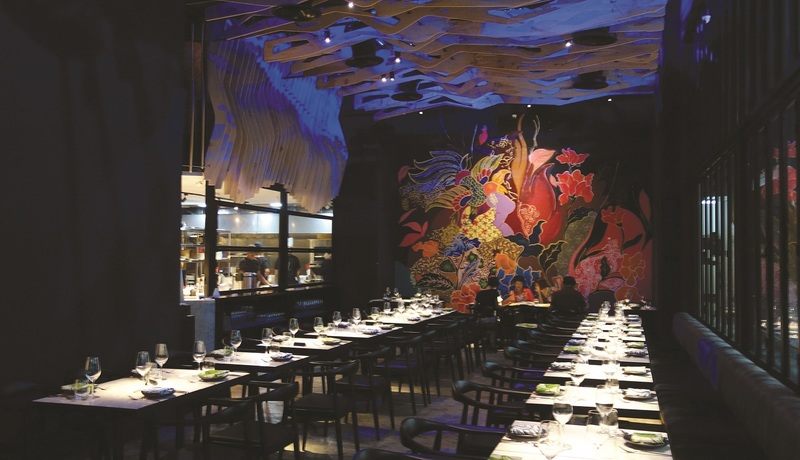 To one side is a spacious rectangular dining area that boasts rows of white-topped tables and ends with a florid batik mural on the far wall. The kitchen sits to one side. Overhead is a ceiling sculpture with an imaginary flow of icicles, or is that stalactites? Spotlights throw shadows and highlights into relief, heightening the sense of mystery. For KL’s increasingly sophisticated diners, it is not enough for the food and service to be outstanding; the setting must also seduce the visual senses, it seems. Beta is conveniently number two in the Greek alphabet (Skillet being alpha, presumably) and it also refers to the royal pronoun for “I” or “me”. Food at Beta is shared, Malaysian-style, and the waiter interprets each dish as it is served. The menu, which is pork-free and features culinary influences of the North, South, East and West, is divided into Ringan (appetisers), Earth (vegetables), H20 (seafood), Land (meat and fowl) and Manis (desserts). From Ringan, we have Inverted Karipap (RM30) — three small cylinders of potato casings with curry cream within, on a bed of fragrant spices; Sago (RM30) — shrimp with laksa aioli on a crust of sago pearls cemented with squid ink paste, served on a bed of raw sago; and Ox Tongue (RM27) — braised ox tongue on toast and given the masak lemak treatment, served on uncooked black beans. Each of the appetisers captures the essence of a taste, a shred of buried memory awakened by a flavour of the kampung and half-forgotten childhood: the karipap of curry and potato flavour given a crispy-cream treatment, the sago of curry laksa shrimp, a mouthful gone before you can place the memory of where and when, the ox tongue delicious with its nuanced textures and the familiar but out-of-place masak lemak flavour with the bite of chilli and the crispiness of toast. We have crispy fried Roti (RM8) and a bowl of fragrant steamed blue rice (RM5) with our mains. Winged Beans (RM27) is finely sliced four-angle beans with the creamy patina of budu aioli, balanced with chilli and ikan bilis scattered on top — light, crunchy, almost nostalgic. Spicy Garden (RM32) is rojak buah remade with jambu air, cucumber, turnip, cherry tomato and ulam herbs with cincaluk granita and a dab of sambal — freshly crunchy with raw overtones and surprisingly light on the tongue with the cincaluk (usually strong-tasting fermented shrimp paste). 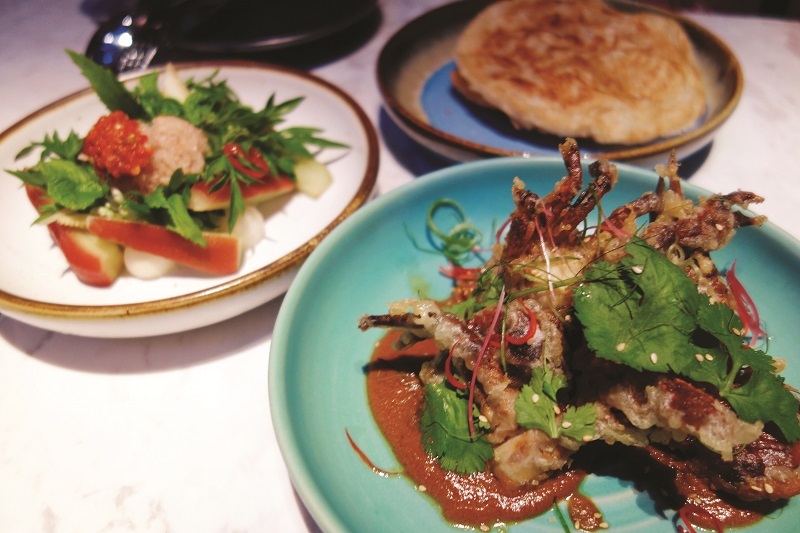 The regal treatment extends to the Soft Shell Crabs (RM45), which is chilli crab reimagined with deep-fried soft shell crabs on a paste of crab extraction — not quite chilli crab but milder, kinder to the senses, crunchier and richer. The Fish Collar (RM60) is barramundi that is even more nuanced; a chunk of tender, fresh fish with a light tamarind paste, served with ulam herbs and garnished with shredded deep-fried kai lan. Chicken (RM45) is unexpectedly a star — boneless chicken pieces on a paste of Bentong ginger pesto. The sous-vide, crispy-skin chicken is tender with the edge taken off the ginger, yet with enough character to be distinctive. Manis yields Banana (RM38) — folds of dehydrated, crisp banana on condensed milk ice cream with sesame and peanuts; a blend of tastes and flavours of roadside snacks. Finally, Tea (RM38) is Earl Grey mousse with caramel overlaid with chocolate branches, which tastes of chocolate mousse, rather than tea, sweetly intense. Beta attempts to revive and relive a Malaysia remembered and tasted through rosy tints, by encapsulating the essence of flavour, sparking fond memories through taste, while reinterpreting Malaysian tastes in a fresh, captivating way that will enthrall and enrapture the diner new to Malaysian food. By encompassing Western cooking techniques and carefully curating ingredients and, no doubt, lots of experimentation, it succeeds, by and large, in creating an experience both fresh and interesting, and sweetly nostalgic. Beta KL. 163 Fraser Place, 10 Jalan Perak, KL. 03 2181 2990. Tue-Sun, Noon-3pm; 5-11pm. Bar is open until 1am. This article first appeared on Apr 9, 2018 in The Edge Malaysia.